Time is money, right? That’s why there are few things more important to your bottom line than tracking your time. That’s were time tracking tools come in — and there are tons of them, good and bad. Let’s separate the wheat from the chaff and find out which ones are worth your while. Easy tracking anywhere: you can use timers on both desktop, iOS and Android devices. Extensive reporting: both in clear numbers and in graphs. Project and client management: directly assign worked hours to a specific project or client, with specified rates. Invoicing: convert billable hours into an invoice for your client. Desktop monitoring: keep track of which applications are used or which sites are visited. Let’s have a closer look at each of these tools, and see what makes them unique. Harvest is a popular time tracking tool. It offers all of the features listed above, except for desktop monitoring. Harvest is perfect if you are running multiple projects with different contributors, tasks and rates. Harvest comes with a limited free plan, but a more useful unlimited plan comes at $12 a month for a single user. Harvest is by itself a popular tool. One of the benefits to being famous is getting to work with the other popular kids! Harvest makes good use of this by integrating with tools like Basecamp (project management), QuickBooks (accounting) and Salesforce (CRM). Harvest has a very ingenious way of setting up projects. 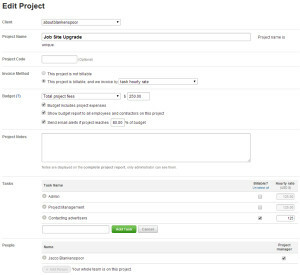 You can specify a project budget with an alert to prevent excesses, and give other contributors insight into the remaining budget. You can also specify different rates based on tasks, contributors, or the full project. One project can contain multiple tasks, both billable and non-billable, and you can assign different people to work on the project. Imagine how this would look if you had several people working for you (including freelancers). Wouldn’t it look amazing? Time logs are shown real-time, so you can track what everyone is doing. And this is just one part of reporting. You can track expenses per (sub-)project and user, view detailed time sheets and easily determine what needs to be invoiced. 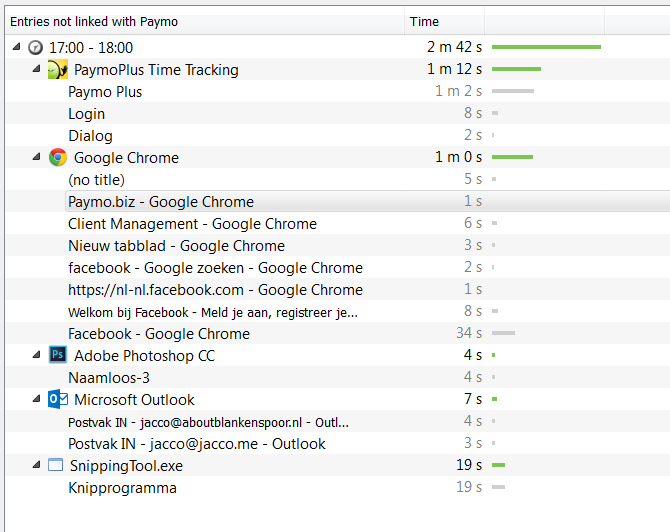 Paymo is the time-tracking tool I use most. I have been using it for years, from the time where there were no useful free alternatives. I still love it. Paymo is currently in between two versions — an upgrade to the beta version of Paymo 3.0 has been available for quite a while now. I am still using Paymo 2.0, which offers all of the features listed above (as will the final release of Paymo 3.0). Update Jan 2015: Paymo 2 is no longer available for signups and will be discontinued on March 20, 2015. Paymo can be used for free if you are a single user, and comes with unlimited projects (though it’s limited to one invoice per month). Upgrades are available from $9.95 a month with two users. Paymo comes with a very convenient goal calendar, which shows you which tasks are nearing their deadline. This helps set your priorities, especially if you’re working on multiple projects at once. Paymo comes with a useful client portal. You can give you clients access to view their invoices and reports. This one is a hidden gem, since you won’t find it on their sales pages. They call it an add-on, but basically it’s just another way of tracking time. It keeps track of everything you do on your desktop. It checks which program you used, and even which tab (browser) or file (program) you were using. This can be a bit intimidating at first, but it’s perfect if you want to check how many times you visit Facebook each day, for example. At the end of the day you just match up tasks to the projects you’re working on. You won’t even need to use the timer in this case, and tracking is accurate up to one second. You can even set up rules to automatically link specific applications to a project. Toggl claims they make time tracking insanely simple. I always love these statements — when they’re true. Is this one? Toggl doesn’t offer invoicing, but it does offer all of the other features listed above. Pricing is very simple: just $5 a month per user with no limits. There are two trials: by default you sign up for the limited version (without adding a credit card), and you can upgrade to the premium version if you add payment details. Toggl comes with an integrated time tracker and desktop monitoring program for your desktop. It shows which slots of time you haven’t tracked during the day, so you can assign that time manually. Toggl offers a Chrome extension which can be used for tens of online apps, so you can start tracking right away. I will use Trello as an example, since SitePoint uses it to manage article publication. When the plugin is active, a small “start timer” button appears on the Trello card. When I press this, a new task is automatically added to Toggl, and the clock starts ticking. After I’m done I just stop the timer and the time is logged. All I need to do it assign it to a project and check if it’s billable time or not. It couldn’t be any easier. Toggl has two familiar layers: project and sub-projects (tasks). It also adds a new concept: workspaces, in which you put one or several projects and users. This way you can group your projects, which makes for easier managing and reporting. Users can also set up their own work spaces, like for non-billable but productive tasks. Freckle has a rather unclear sales page. They try to sell a solution by listing problems, but it’s not really clear how they solve these problems until you sign up. But believe me, once inside it’s all crystal clear. Freckle is very focused on simplifying time tracking. There’s the familiar timer, of course, but they wanted to improve the process of adding manual entries. Freckle is the most expensive solution we’ll look at here, with their entry plan priced at $19,95 a month for a single user (no usage limits). Let’s start by looking at how easy it is to add manual entries. I must say, it is very easy indeed. There is an entry bar at the top of every page. Here you select the date, fill in your spent time, select the project and use a hashtag to define your task. The hashtag is something I haven’t seen before in time tracking, but it a nice take on the usual task specification. And by adding an simple asterisk (*) you make that tasks unbillable. Freckle has a convenient way of checking back on time spent. 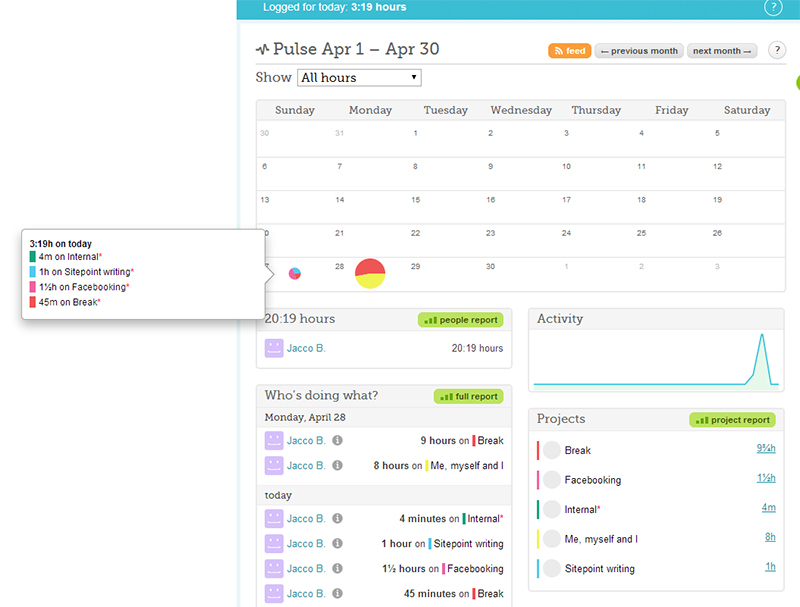 The feature is called “Pulse”, and it shows you a calendar with you entries. Just hover over each day to get a breakdown of project time. From here you can also easily access the full report for that day and see which activities (hashtags) were logged. The invoicing process won’t cost you much time either. Most of the invoice is filled in based on the time logging you’ve already done. You can send along detailed hour specifications, and opt for direct payment using PayPal. It’s done faster than with the other tools, while still looking good and professional. RescueTime has a very different but interesting approach to time tracking. The focus is on you as a productive user. It’s not so much what you are working on and for whom, but more about how you do it. You can do this by setting goals on how much you may spend on a specific task and alert you when you go over your alloted time. You can even go as far as blocking specific types of sites that are proven to be distracting to you (there’s Facebook again!). It’s great if you’re low on willpower. In the end it’s all about how you spent your day. Therefore there is no project management, no invoicing and actually no real timer. All tracking is done unobtrusively, in the background. You have to install a program (or an app on mobile devices) though which all tracking is done. RescueTime comes with a free plan which allows for tracking time and setting goals. If you want to get serious about your time tracking and add on features (like site-blocking), it will cost you $9 per month. Let’s start by looking at how the tracking is done. As you can see in my screenshot, it’s clearly specified how my total of 11 minutes is spent. Each activity is rated on a productivity scale. “Very Distracting” sites can be blocked for a given amount of time from the desktop app. When that is enabled, any attempted visit to a distracting site will display an error page. 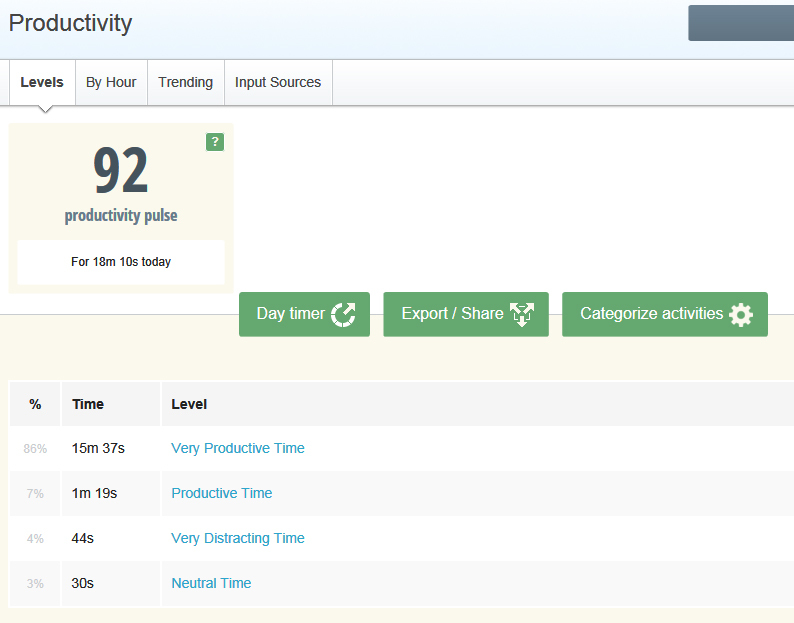 The productivity scale is customizable, so if social media is your work, not a distraction, RescueTime can still help. I always like rankings, and I found RescueTime’s “Productivity score” to be very useful. I think we all have these days which quickly fill up with small tasks. That doesn’t feel very productive. This score tells you whether your instinct is correct or not, which might convince you that the day wasn’t a complete write-off. Another motivation booster, the Daily Highlight really shows that RescueTime gets what’s important. The Daily Highlight will show you what you’ve done during the day. You can add accomplishments yourself, which always makes me feel more productive. It’s just a simple snapshot of your day, but over the course of a week this can make the difference between feeling like you’ve wasted your week and knowing that you’ve been on-task. After reviewing these great tools it’s clear time tracking can be done in a few different ways. You can do it manually if you have the discipline. Or, if you’re more like me, desktop monitoring can be a better way to do it. Using RecueTime might be a good start if you feel like you are losing hours throughout the day. I know I did, and I really should cut down on Facebook (and stop convincing myself it’s a valid business activity). In the end, it’s all about making and justifying billable hours, and for this I believe you can’t really go wrong with time tracking. Let me know how you feel about time tracking in the comments, and which tool you use.